Full dentures are a removable appliance with artificial teeth used to replace all the missing teeth in your mouth. After your teeth are extracted you will need approximately 6 weeks of healing time. This will ensure the best fitting denture requiring a lower possibility of future relines. If you are looking for a very secure fit of your denture implants can be used. A minimum of two implants can be placed in your mouth while two attachments are placed in your denture. This prevents any movement of the denture while eating or talking. Full and partial immediate dentures may be placed the same day teeth are extracted. They are made completely out of acrylic. Immediate dentures are mainly used for esthetic purposes during the healing time after extractions. As your jaw heals your bone remodels creating a space between your gums and denture. After complete healing has occurred, you will need a reline or a new complete or partial denture to ensure a proper fit. 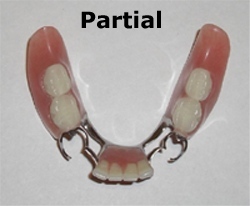 A Partial Denture is a removable appliance with artificial teeth that replaces any missing teeth you may have. This will be held in place by clasps which attach to your healthy teeth. 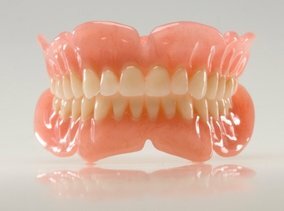 In our office we make two types of Partial Dentures. One has a metal framework with an acrylic base and the other has a clear framework (Clear Met Partial) with an acrylic base.